Traveling with a quest takes individuals on a destination worthy of being visited. And the journey becomes pious when it is made for the search of God and solace in Nature which is what one gets in a very small village – Devikulam hill station – the place with the lotus pond of Goddess. People on vacation in world famous Munnar might not formerly aware of Devikulam as a hill station which is isolated but one glance around here and there is no doubt that the chilly in the air, greenery on the slopes, low hanging clouds over hills and the Sita Devi Lake surrounded by colors and vibrancy of Nature are to be cherished forever. Just 16 Km away from Munnar, Devikulam in Idukki district of Kerala is often a part of combined package tourists and vacationers take to come to this place. The village is very small, thus seem crowded in summers when locals take weekend trips to get immersed in the views of Nature as she resides here. 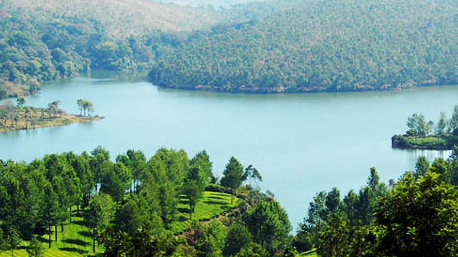 Devikulam tour has many reasons; nearness to Munnar, the prominent ones are beauty of the place, legends and mythology associated with the place that tells about Goddess Sita (Wife of Lord Rama) bathing in the lake after which it is named since then, skin-ailments treating water of the lake and numerous opportunities to explore hills through trekking and hiking. In God’s Own Country, journey to all the places become a pilgrimage in their own likeness!